Industrial Conveying (Aust) Pty Ltd has launched its new, updated web site which includes many new technologies and services introduced in recent months. 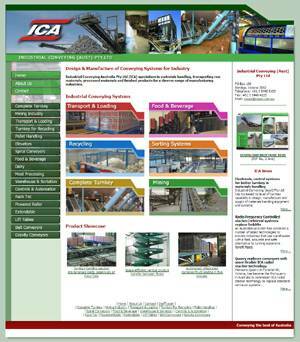 Found at www.icaust.com.au, this new web site has a very user-friendly interface arranged so information on every aspect of Industrial Conveying is just one button click away. The revamped homepage also includes video footage of its dock loading technology in the ‘transport and loading section’, as well as three short demonstrations of the company’s versatile Spiral Conveyors in working scenarios. It includes a complete list of products and services, a pictorially-driven product showcase as well as reproductions of news and feature stories on the company that has appeared in business-to-business press. Services listed include complete turnkey solutions, mining industry technologies, transport and loading facilities, recycling solutions, pallet handling systems, warehouse and sortation technologies, food and beverage, dairy and meat processing solutions as well as controls and automation capabilities that optimise all these applications. Products listed in the website’s convenient menu include elevators, spiral conveyors, powered rollers, Rack Tec racking technology, extendable conveyors, lift tables, general conveyors and gravity conveyors. A simple click on any one of these tabs takes the user into another page containing information on every single product, technology or service within that section. For instance, once a user clicks into the ‘food and beverage” section, the following products appear: knife edge conveyors, 90°/180° modular belting type conveyors, plastic modular belt type conveyors, slat band conveyors. Click-through pictures also show these items in applied environments. As an added service, the company’s most up-to-date hard copy product brochure is available as a pdf which can be downloaded free from this site. Compared to its predecessor, this new website also offers more information on the company history.